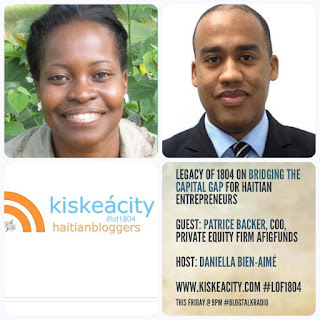 This friday at 9PM, join guest host and blogger Daniella Bien-Aimé of the Bien-Aimé Post as she discusses investment capital for Haitian entrepreneurs in Haiti and the diaspora with Patrice Backer, COO of Afigfunds, a private equity firm. This show will be live so please call in to participate in the conversation. Listen Live or archived online at http://www.blogtalkradio.com/pancaribbean/2016/07/23/legacy-of-1804--bridging-the-investment-gap-for-haitian-entrepreneurs-lof1804. You can also listen and participate on the phone at (714) 242-6119.